Medicine is of course a separate health profession. One of its specializations is psychiatry. 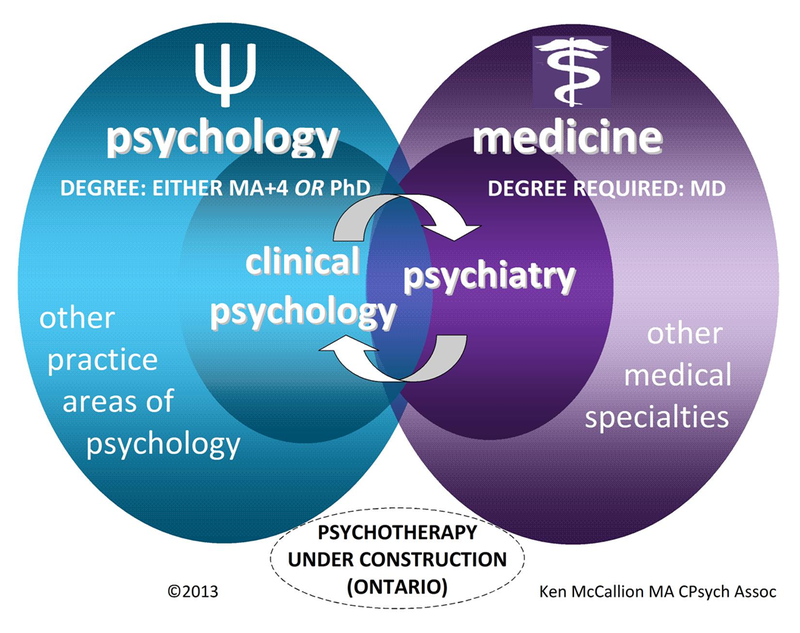 The subdivisions of psychiatry are Paediatric and Adult. Psychiatists, as physicians, can prescribe drug-based treatments. They may use other therapies, as well. Psychologists use only evidence-based treatments — and a very wide range of them. So-called ‘talk therapy’ may be a component (and sometimes invaluable) but other examples include home-school collaborative behaviour consulting, experiential therapies, mindfulness training, covert sensitization/desensitization, and many others. Each is finely tuned to the types of issues or disorders one brings to the work — even when it seems it’s unheard-of, many are surprised to learn that it’s well researched and the psychologist knows exactly what to do. But there’s more: Based on a full, human appreciation of your strengths and needs, psychologist and client take that already-fine-tuned therapy and tune it, further, to who you are as an individual. This is very far from being just ‘pigeon-holed’ into a Diagnosis X and being given Treatment Y. This gives the client a truly dignified and proactive way to confront a serious, psychological concern. Unfortunately, the title ‘Psychotherapist’ has a long history of not meaning much at all, in Ontario and some other places. Efforts are underway to structure a new healthcare college, to regulate the use of ‘psychotherapist’ so that appropriate candidates can work for it, earn it, and use it proudly for the first time. Children and teens usually don’t buy any of this, at first. Keep in mind that NO-ONE EVER wants to go to a psychologist (OMG) unless there’s gonna be FUN. Damn straight. The thing that surprises many parents is how insight-generating the fun can be. Parents also find out what kinds of collaboration and teamwork they can build with their child, through attachment-oriented or ‘dyadic’ sessions and separate, parent-only, consultation sessions. A future post on this blog will say more about what kinds of dynamic teamwork that psychology and psychiatry can sometimes pull off, when client needs require it. If you have questions about this topic or about psychological services at this clinic, feel free to use the contact form, below.